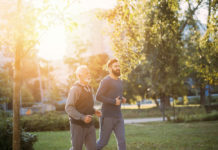 If your mobility and ability to perform basic daily tasks in your advanced years is important, then preventing sarcopenia, or muscle loss, as you age should be on the forefront of your mind. 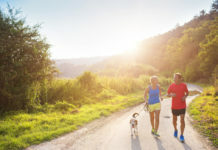 Luckily, science is uncovering a variety of methods to help reduce sarcopenic muscle loss, as well as rebuild muscle after muscle losses have already occurred. The old saying holds true, “Use it or lose it,” when it comes to maintaining your body’s skeletal muscle. Staying active, as well as eating the right amount of protein in your later years is vitally important. As it turns out, the ‘dose’ of protein at meals is becoming increasingly central to rebuilding and maintaining muscle in the body. 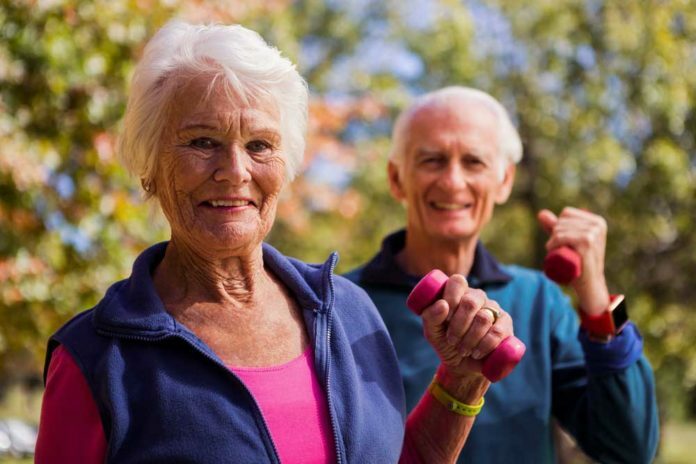 According to researchers, it is estimated that about 30% of elderly adults aged 60 years or older suffer from sarcopenia – or muscle loss – in the United States. That number jumps to about 50% in adults aged 80 years or older who have significant losses of muscle mass. Sarcopenia is defined as a 3-8% reduction in lean muscle mass each decade after age 30, in both men and women. Some of the main causes of muscle loss in the elderly include bed rest, involuntary weight loss, and reduced mobility, which all contribute to sarcopenia. It is important for these individuals to build strength back up again, and to increase mobility and strength after a period of muscle loss. The first step is ensuring that you are consuming at least 30g of protein at one meal. Thirty grams of protein is the equivalent of about 4oz of meat like poultry, fish, seafood, beef, or pork. Eating less than that means muscle protein synthesis will be blunted, so make 30g a target protein goal for a meal. Leucine is a specific amino acid –one of the building blocks of protein—that is of utmost importance when it comes to enhancing the synthesis of new muscle in elderly adults. It’s important to hit a ‘threshold’ for leucine in order to ensure that muscles cells receive a strong signal from hormones that start up muscle synthesis. Eating 30g of protein, or around 4 oz of meat, at meals can help ensure this threshold is met in order to increase muscle mass. Resistance training – such as lifting weights or performing calisthenic exercises like pushups, sit-ups, and lunges – has been shown to help reduce muscle loss as well, due to the stimulus of muscle growth following the stress of exercise. If protein goals are not being achieved by the diet, muscle loss can occur even with adequate exercise. Just like concrete, wood, and nails are required to build house, protein and amino acids serve as the building materials of choice for muscle tissue. Going above and beyond the 30g or protein recommendation does not seem to offer any additional muscle-building benefits. One study compared a 30g protein meal to a 90g protein meal of beef, and found that the higher amount of protein did not result in any further increase in protein synthesis, in both young and older adults. Below are some examples of 30g of protein servings that you can incorporate into your daily meals to help reverse muscle loss. Douglas Paddon-Jones and Blake B. Rasmussen. Dietary protein recommendations and the prevention of sarcopenia Protein, amino acid metabolism and therapy. Curr Opin Clin Nutr Metab Care. 2009 Jan; 12(1): 86–90. Douglas Paddon-Jones, Kevin R Short, Wayne W Campbell, Elena Volpi, and Robert R Wolfe. Role of dietary protein in the sarcopenia of aging. Am J Clin Nutr May 2008 vol. 87 no. 5 1562S-1566S. Symons TB, Sheffield-Moore M, Wolfe RR, Paddon-Jones D. A moderate serving of high-quality protein maximally stimulates skeletal muscle protein synthesis in young and elderly subjects. J Am Diet Assoc. 2009 Sep;109(9):1582-6.